Jared, Karen, & Daphne: 2 MONTHS OLD!! Daphne is now 2 months old! We celebrated by going to get her immunization shots, poor girl. We are so thankful she is doing well and is a healthy baby! She weighed 10 pounds 12.5 ounces (50th percentile), was 21 inches long (40th percentile), and had a head circumference in the 55th percentile. She is a cute little well-proportioned baby! Meanwhile, we have begun the adventure of establishing a bedtime routine and going to sleep at a decent bedtime. She sleeps well at night, but sometimes "night" starts at 2 am. I'm sure bedtime is one of the more difficult things to tackle, but in the meantime mama prays for energy and a good attitude. However, when Daphne is awake and smiles at me in the middle of the night, I completely forget how late it is! Baby smiles are a tender mercy from above. Our poor baby's battle leg wounds. Please take note of her cute double chin. We have also made a new friend! Her name is Bumbo, and we didn't like her at first. Now I think we are going to be spending many happy moments with her. she is so pretty! I want to hold her so bad!!!! Oh my Gosh! 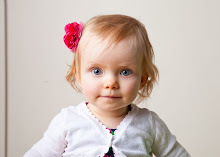 Either Daphne is the most photogenic baby ever or you are an awesome photographer (or actually, probably both!) The beackground made it so I can't read the commentaries, both the pictures tell it all!